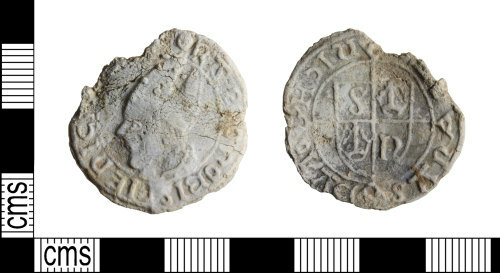 An incomplete lead medieval token of the Boy Bishop type, dating to the period AD 1400-1500. The obverse shows left facing bust, surrounded by a crude legend. There is a shield on the reverse, divided into quarters and with a letter in each quadrant, surrounded by a crude legend. It probably imitates a Henry VII groat, and is similar to those listed in Fletcher's Leaden Tokens and Tallies, p31. During medieval winter solistices it became a Christian tradition for each town to elect a Boy Bishop whom was paraded around on processions. In the processions, lead tokens were handed out to the crowd to celebrate the event. This is based on the Roman celebration 'Feast of Saturnalia' which was where society was turned upside down. The Christian community evolved the event so instead of the King of Slaves elected, the Boy Bishop was. Obverse description: Left facing bust wearing mitre. Reverse description: Shield divided into quarters, a letter in each quadrant.